To be honest, I was too lazy to find out if this has been discussed already somewhere. Like others I try to avoid infills as they are time consuming and don't add much strength to the part. Main reason for using them is to provide some substructure for large top surfaces. I don't like the small "enforcement" zig-zag infills close to slanted walls very much either. When not printed very slowly the corners tend to curl up, giving a quite rough surface which may cause additional trouble. And I don't like the additional retractions caused by infills. Less retractions are always better. So why not add an additional innermost perimeter line that oscillates inwards (in direction of the path normal) instead of infills? Amplitude and frequency should be adjustable. With high amplitude it would provide support for top surfaces. It also adds structural strength because it is partially fused with the perimeter. With high frequency (and low amplitude) it would replace the enforcement infills for slanted walls. And there are no additional retractions. As the path follows the topology of the perimeter it should be as aligned to the layer beneath as the perimeter (... at least hoping that, I haven't studied maths ...). If calculations for smooth corners are too complex, sharp corners should work as well. Of course the oscillating would have to be clipped at certain places like tight bends. - Is one layer enough to make it stable? - Is it visible on the outside of the print (there is such an effect with injection moulding)? - What is the most suitable type of oscillating curve? I assume a thickness of 0.4 mm should work quite well. If not, two oscillating lines will do it. It might be visible, depending on wall thickness and material color, like the normal infill. The curve is an interesting question. I like the idea of having longer segments in touch with the perimeter and peaks facing inwards, like bracings. However the peaks should be printable without any risk due to the sharp corners. Some narrow Gaussian might do the job. Practically it would be rather a convolution of a Rectangle with a Gaussian. The smooth tip should lead to shorter print times compared to a sharp peak. One of the things I would really like to see, is an infill that automatically adjust so that it is less dense at the bottom and increases in density over height to support the top layer. 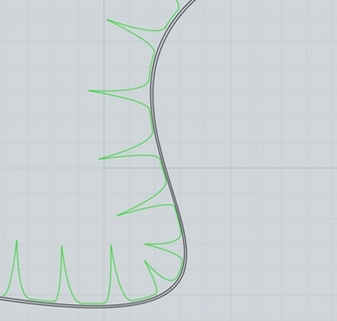 Something where you would tell the computer the maximum unsupported span and maximum angle of an overhang and it would calculate a suitable branching infill pattern. That would be a very nice feature, indeed! What about randomly rotating the infill pattern with every layer? Sort of making a birds nest infill.